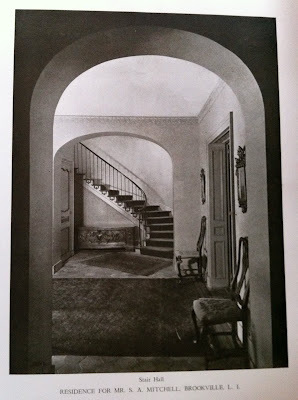 'Marney', the Sidney Alexander Mitchell estate designed by James O'Connor c. 1924 in Matinecock. Mitchell, son of Sidney Z. Mitchell who resided next door, was an attorney, president and director of Bonbright & Co., special attache to the Court of St. James, president of the Federation of French Alliances in the United States, vice-president of both the Institute for Crippled and Disabled and the Institution for Relief in Belgium and author of S.Z. Mitchell and the Electric Industry. Click HERE to see what 'Marney' looks like today. Click HERE to see 'Marney' on google earth and HERE on bing. Photo from Selections From the Work of James O'Connor. I don't know all the facts here... Mitchel owned from Ck Valley north, Thorne Lane east to Valley, that triangular shaped property was part of the Piping Rock Estate development. It appears the 20s were VERY good to the Mitchel's. He bought land that was intended for the new "smart" size mansion concept envisioned at "Hedgegrow" or "West Gate Lodge". He then preceded to shell out money for three substantial homes for his family with extensive landscaping. Comparing today's money-elite and the homes they have built to yesterdays... Here we are still talking about homes that no longer exist... will that be the case of the current crop??? See, if you post every day you'll never miss a thing! If I said some of the recent nearby homes would and should be torn down before Marney simply because they're ugly, would that make me guilty of architectural speciesism? It is a particularly handsome house, especially on the garden side. (And here is the whitewashed brick and light [green? or maybe gray, here] shutters scheme I recommended in yesterday's post). I don't think I have ever seen a James O'Connor house in person; is this considered one of his best? As with yesterday I know this house is not a pace setter but I think they did what they did here very well. I am also not familiar with James O'Connor but he seems to have had a talent for quiet, elegant style; although I suspect the Mitchell family laid out the basics since the two houses have similar exteriors. HPHS, I don't think anyone one day will bemoan the loss of most of the houses being built today -- of course there will be exceptions. From what I can tell most of the new construction is too many square feet, oddly allocated, on too few acres & a noteable lack of craftsmanship. I still scratch my head when I read about a 5,000+ square foot house with only three bedrooms -- don't they want company to also enjoy their house? DFP et al - not only is there a lack of craftsmanship and reinventing of the wheel but every house has to have modern amenities (electronica) shoved in our face and furnished with cheap furniture. there are enough antiques still extant at a reasonable price (see DED) to make even the ugliest of these piles look presentable but no one takes the time to do it. they all seem to feature a bunch of mass produced junk that everybody has inside cookie cutter architecture. where's the fun in that? and they ALL lack the one thing that made the old estates work - extensive landscaping and gardens. i'm sure the owners would scream labor costs but if they can afford to build these excrescences, they could afford a couple of arborvitae and a rose or two and the guy to prune them. 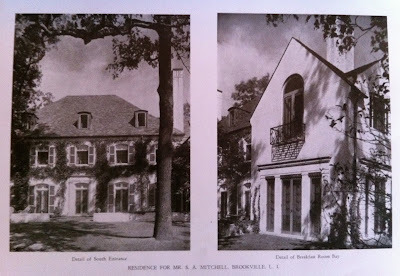 re:today's Mitchell house - i'm glad to see it continues the New England tradition of putting two houses of different arch. styles together - a common practice up here in the sticks. it was done here mostly not to waste anything but in this case i think it works. a question however - is it just my monitor or are the windows in those dormers set in about a foot. i like them either way and the first floor windows with the arched tops are particularly fetching. oh, come on - you know it's not nice to confuse the elderly (too easily done)- next to Marney on Bing is this really eclectic little house with these swooping roofs and a little cupola tower thing until you rotate and its been replaced by what i railed about in my previous post. Turner and I find ourselves once again on common ground. It's not just the demolition---after all times, economics, styles, etc. change....it's the remarkably high percentage of vulgarity in the new stuff. 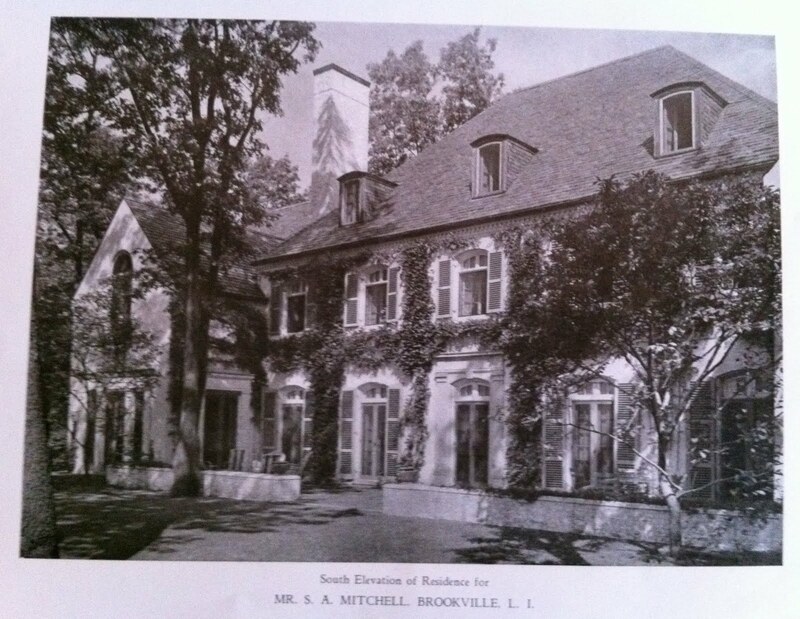 BTW--I don't know the answer to yesterday's question about the Sidney Z. Mitchell townhouse, but I do know the answer here: Sidney A. Mitchell lived at 740 Park. DED, thanks for the link to the 'Time' magazine article. TPR, get out your time machine & set it to Manhattan, March 1930 -- there's a flower show we all need to see.